The specimens recovered have given representative examples of almost all of the bones of the Australopithecus afarensis skeleton. From this, it is clear that there are many significant difference between Australopithecus afarensis and its ape predecessors, one of which is crucial to later human evolution, bipedality. The position of Australopithecus afarensis in the phylogeny of early humans is under debate. Many feel that it is ancestral to the east African "robust" early humans, and possibly to all robust forms. Additionally, Australopithecus afarensis is proposed as the ancestor to later Homo. Yet, research now suggests that Australopithecus afarensis might be ancestral to later Homo. New and more complete specimens of Australopithecus afarensis are helping us better understand the morphology of the skull of this early human species. 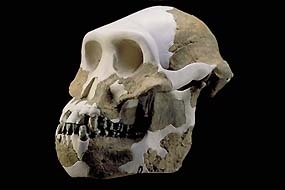 Recent work on a new reconstruction may indicate that the morphology of the Australopithecus afarensis skull was much more like that seen in the so-called "robust" australopithicines.